Harry Bush was born in Brighton in 1883 and received his early education there. 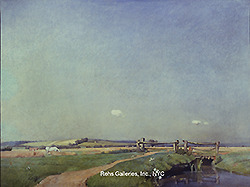 After his father’s death in 1898, the family moved to London where Harry joined the Carlton Studio, Chelsea; studying under the watercolor artist and decorator Frederick Taylor, RI (1875 – 1963) -- so inspired by the artists at Carlton, Harry decided to join the Regent Street Polytechnic in order to continue his artistic training. 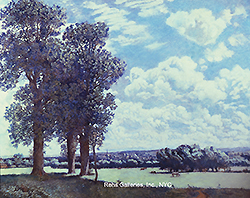 During his years at the Polytechnic he had the luck of attending a visiting exhibition from the Clapham Art School. Amazed by the quality and style of the artists on display (most notably by Noel and Margaret Nisbets’ work), Harry left the Polytechnic and headed for the Clapham School. In 1910 Harry married Noel Nisbet and moved to Battersea Park Road. Shortly thereafter they set up a studio at 19 Queensland Ave., Merton Park. This property and the surrounding suburbs, which were featured in many of Harry’s paintings, helped earn him the title of The Painter of the Suburbs. Harry’s work reflected his personality, that of a quiet, philosophical man. He quietly observed what was around him in Southwest London, and noted the skies, sea and trees of his holiday haunts, mostly in the West Country. From 1922 onward, Harry was a regular exhibitor at the Royal Academy; displaying over 25 works in all. He also exhibited at the Royal Institute of Watercolor Painters; British Watercolor Society; Royal Institute of Oil Painters (of which he was a member); as well as exhibits in many cities throughout England.